Extensions: View your extension(s). Default extension selected by clicking in white circle. Voicemail: New message(s) will be indicated in the Voicemail button in the Dialpad. Click the Voicemail button to access message(s). On Hold: Displays held call(s) details (drag and drop to your extension). 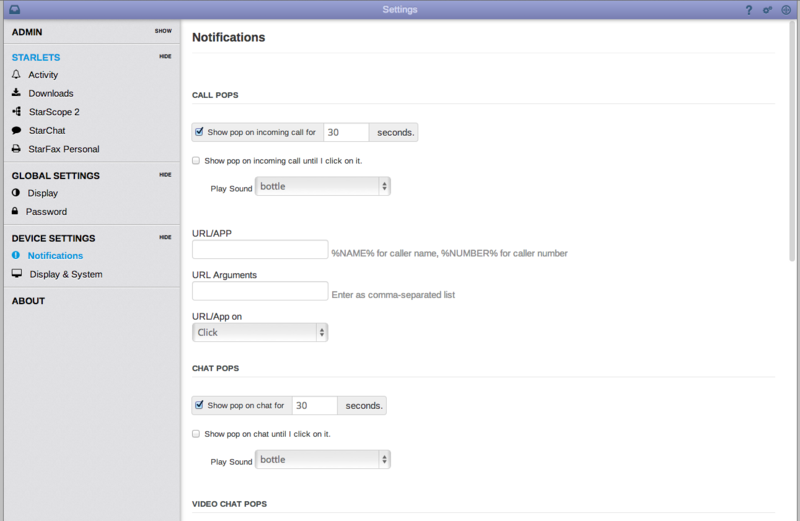 Parked Calls: Displays Parked Calls (drag and drop to your extension). 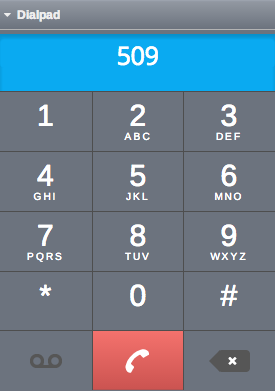 Dial a Number: Dial any number using the Dialpad. (Details provided below). Chat: Run multiple chat sessions with users. (Details below). Conference Calls: Displays details of conference rooms e.g. # of participants and CallerID. Groups: Organize extension users into groups e.g. Sales, Marketing, Support. Settings: Click (top right of screen) to access compact or expanded display. Sort settings, filters, global settings, privacy mode (details below). Navigation: Click (top right of screen) to open the Navigation screen. Starlet Navigation Click arrows to navigate through the Starlets. Shoebox: Click to open the Shoebox. The Shoebox displays your contacts. displays your complete list of contacts. Click to display "Group" contacts. Add "Group Name" and "Group Members"
Dial a Number: Click the number buttons within the dialpad and click to make a call. Your extension will start ringing Answer and your call will be completed. Green phone icon turns red when call is active. Extension Users/Locations: The right side of the StarScope 2 screen displays extension users by location and any groups you have decided to display using the Settings filter feature.The extension user icon color will change based on the status of that extension (see Extension Status Colors above). Click the extension user icon on screen and the following display (showing the selected extension number) will appear showing a number of options. Call an extension user on any location associated with your system. Click .Your extension will start ringing . Answer and your phone call will be completed. 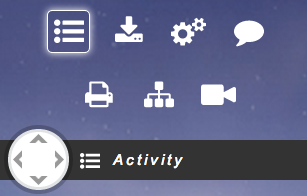 (This feature is also available when you hover your mouse over an extension user's icon on screen). Send an extension user an email. Click the and your email client will pop on the screen with the email credentials of the selected extension appearing in the To: field. Follow your normal email process to send. Chat with an extension user. 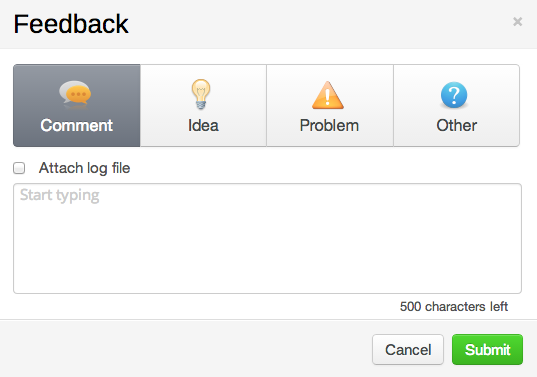 Click the icon to start a chat session which will appear in the Control Panel. (see example below) Multiple sessions with other users can be started. If the StarScope 2 application is not showing on screen and a chat message is received, a chat screen pop will appear in the lower portion of your screen. An audible notification is also played. 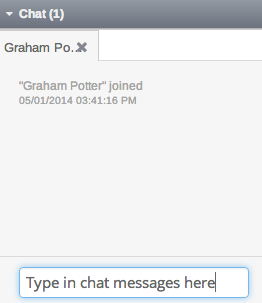 The chat pop will display the user detail with a "Join" button option. Call an extension user cell phone. Click the icon. Your extension will start ringing . Answer and your call will be completed. Invite to Video Chat Click the icon to initiate a video chat session with that extension. Drag and Drop Transfer to an extension. With a call answered on your phone, move your mouse up to your extension in the Control Panel. Click and drag the icon that appears next to your phone details. Drop it to the extension of your choice to blind transfer the call. 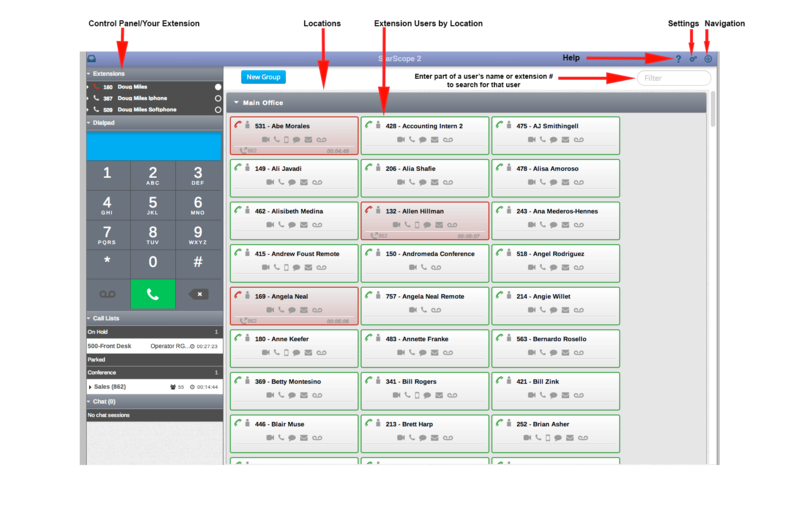 Click the CallerID display of your call to display a dropdown menu displaying Call Control options. Click the option you require and follow the on screen prompts if applicable. 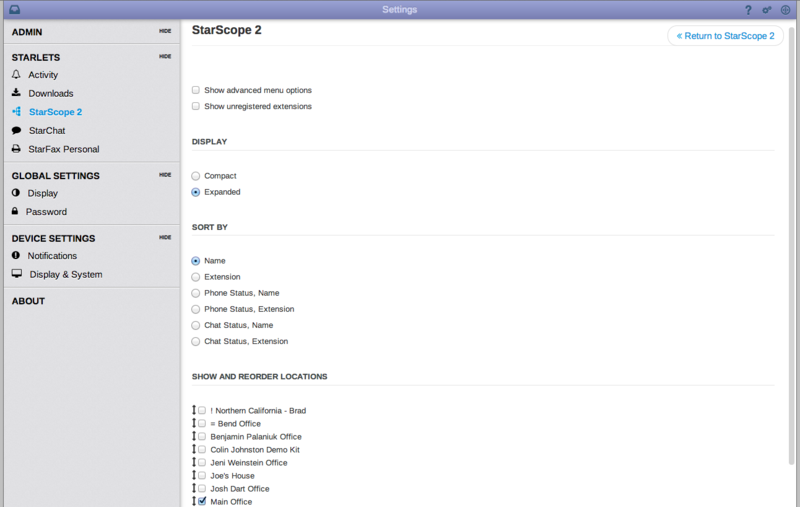 Show Advanced Menu Options: Check box to display advanced menu options on StarScope 2 screen. Expanded View: Click to display expanded view of extensions. Compact View: Click to display compact view of extensions. Reorder/Show Hidden Locations: Click to enable reordering and showing hidden extension locations. Collapse All: Click to collapse view of extensions. Jump to: Click to open drop down menu to jump to other extension groups. Sort by: Click to select sort options to display. Display: Under Global Settings, set Privacy, Availability and Avatars options. Password: Under Global Settings, you may change your password. Notifications: Under Device Settings, click Notifications to display options for Call Pops, URL/APP, Chat Pops, Video Chat Pops, Voicemail Pops and Fax Pops. Options for Pop display time and sound for calls, chats and faxes are available. Screen pop to URL or application is available for integration to a CRM system for record search and presentation to a user. Display and System: Under Device Settings, click Display and System to display Extension and Startup Starlet information. You may select the Starlet to be displayed at startup by clicking on the dropdown menu next to Startup Starlet. You may also select Framework options. Incoming call notification displaying the caller detail is displayed via a screen pop to the lower right portion of your screen. An audible notification is also played. Click into the screen to see an enhanced pop. (Note: You may click on the URL/APP button to access the caller's website or click the Send to Voicemail button to send the call directly to your voicemail). The enhanced screen pop provides the ability to enter the reference notes for this call. Enter any notes required in the screen provided. Notes will display within the call record in the Activities screen when the call has completed. You may also edit notes in that screen. Operator Mode: Your system can be set to work in Operator Mode. Contact your reseller for details. 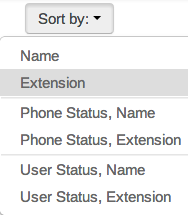 In Operator Mode, you may change user status (Available/Unavailable) by clicking on . Click on the desired availability choice. 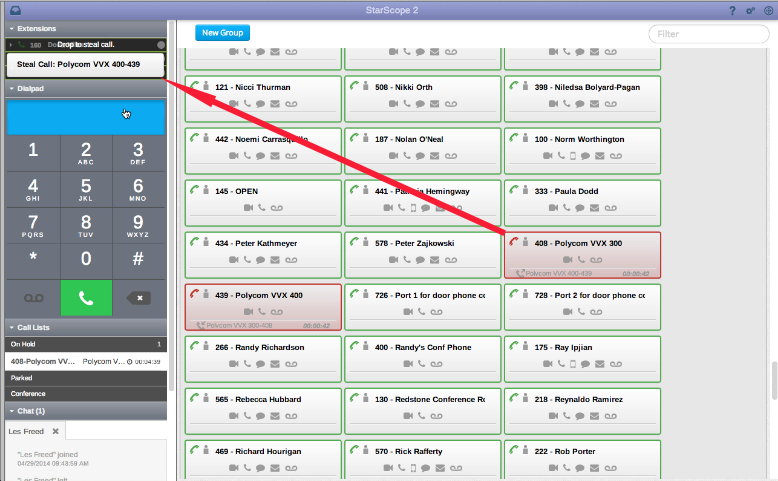 Call Steal: StarScope 2 has a Call Steal feature that allows you to move a call to another person or to the operator. 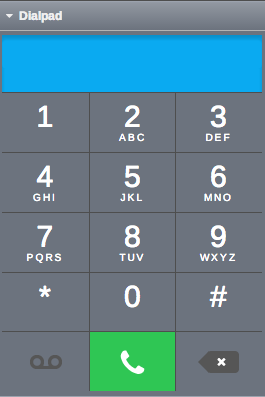 Click on the phone icon of the current call and drag it to any available displayed line appearance. The call will be transferred. Click to view updates to the StarScope 2 Framework. Click to submit feedback on the StarScope 2 Framework. Click to submit a comment, to submit an idea, to submit a problem or to submit other comment or issue. Click to logout of the StarScope 2 Framework.